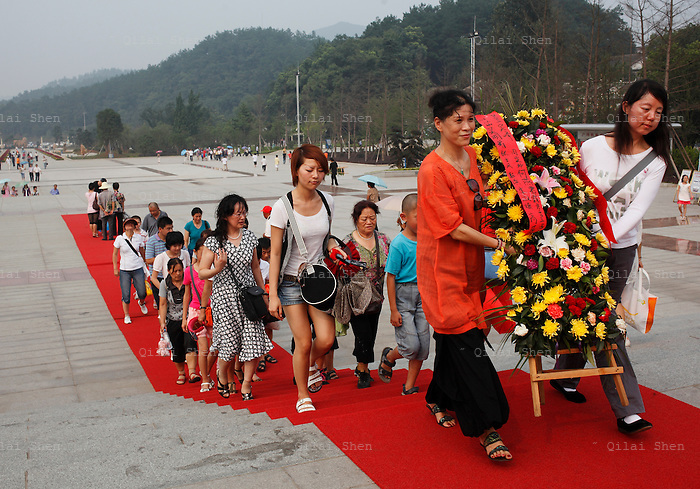 Visitors offer a flower reef to a statue of Mao Zedong at the Statue Square near Mao's birthplace in Shaoshan, Hunan Province, China on 12 August 2009. The village of Shaoshan, in rural Hunan Province, is tiny in size but big in name. It was the childhood home for Mao Zedong, the controversial revolutionary who came from obscurity but eventually defied all odds conquered China in the name of communism. Now his home, a sacred place among China's official propaganda, is in reality a microcosm of the country itself: part commercialism, part superstition, with a dash of communist ideological flavor.